An impossibly distant future. A vast sprawl of planets, each without parallel, with its own bizarre customs, bedevilling procedures and wily inhabitants. As one of the implacable, revenge-seekers populating the Gaean Reach Roleplaying Game, you know the correct intelligence on these worlds makes all the difference between grim success and howling failure. 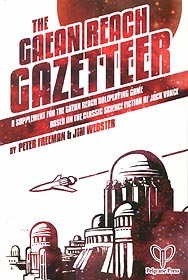 As a GM running The Gaean Reach Roleplaying Game, this exhaustive cataloguing of the planets and places of Jack Vance's classic science fiction cycle will keep your players hopping. As a fan of Jack Vance who wouldn't know a D6 from an intersplit engine, this indispensable guidebook gathers the beauty and danger of his incomparable worlds into one handy reference. Plan your next jaunt to the glass towers of Alphanor, the Groaning Ocean of Ladaque-Royale, or the Oxygen Marshes of Cuenos Notos, where frolics the delirious five-horned darango. COmpare the amenities of such establishments as the splendid (if overpriced) Hotel Tarquin, the notorious Wild Isle resort, and the blackmailer-ridden Sin-San's Tavern. Contemplate the technical specifications of interstellar space-yachts, packets and liners. Learn of the Reach's currencies, surveillance technologies, and computing devices. Study with academic detachment weapons ranging from the subtly lethal air-tube to the ostentatiously combustible flame-staff, from the workaday projac to the highly illegal Dys Model G Skull-splitter. Brought to you by renowned excavators of Vancian lore, Peter Freeman and Jim Webster, this book will not protect you from accusations of weaselry. But it can tell you which planet you might best escape to when such charges fly.